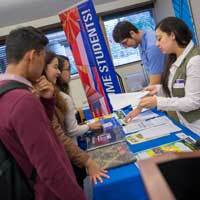 Webster University's Multicultural Center and International Student Affairs (MCISA) welcomed a new class of international students during International Student Orientation on Jan. 8. The group included students studying abroad to St. Louis from the Switzerland, Ghana and Thailand campuses and several graduate students transferring to St. Louis from the Orlando, Florida campus. Graduate and undergraduate international students from 17 countries joined us for Spring 2016 including: Brazil, Canada, China, Equatorial Guinea, Ghana, India, Japan, Libya, Morocco, Myanmar, Nepal, Nigeria, Pakistan, Saudi Arabia, South Korea, Venezuela and Vietnam. "We are delighted to welcome a new class of global Gorloks to the home campus in Webster Groves," said Bethany Keller, assistant director International Student Affairs. "The enthusiastic group of students kicked off their new experiences here in the States with icebreaker activities, connecting with campus and community resources, learning the details of their visa requirements, preparing for classes and exploring academic support resources, all while having fun getting to know each other and our current student volunteers." Our next orientation for new international students will take place March 11. Volunteers are always welcome to assist the MCISA team in greeting students at the airport, helping with event logistics and joining our welcome teams. Please contact Bethany Keller at bethanys@webster.edu for more details.